Here is an example of the consequences of the failure to reform the outsized and kleptocratic financial system after bailing it out, even years after the latest financial crises. The former Greek government was certainly more compliant to Western banks and political suggestions. It was the introduction of a 'reform government' in Syriza that rustled the feathers of the international kleptocrats and their organizations. I would like to see Europe and Asia begin to take stronger measures to prohibit these banking cartels with long records of banking violations and market rigging from doing business in their regions and with any of their official financial instruments. The US apparently does not have the political will to reform its banking system. How much damage will they stand by and permit these sorts to visit on their people, who always seem to be picking up the pieces, through austerity and privatizations of their national assets. Will these new trade agreements even allow them to exercise their national sovereignty to protect their people from fraudulent financial practices and price gouging in the future? The apologists for white collar criminality like to say, 'don't hate the player hate the game.' But the only way to make the game honest again is to have these bent players take responsibility for their actions, and for the judges to start handing out red cards to any repeat offenders. That would be more statesmanlike than visiting harsh punishments, and austerity, and slanders on their victims. 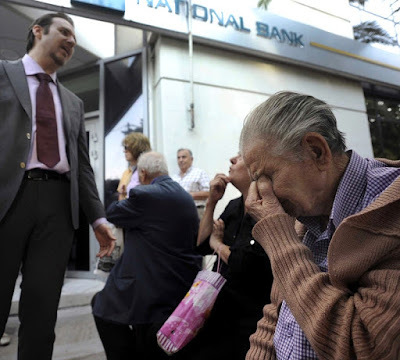 Are Goldman Sachs executives Lloyd Blankfein, Gary Cohn and Addy Loudiadis losing any sleep over elderly pensioners waiting outside shuttered banks in Greece, desperately trying to obtain their pension checks to pay their rent and buy food? Are these Goldman honchos feeling a small pang of conscience over the humiliation by creditors of this once proud country? Perhaps Blankfein, who famously espoused that he’s “doing God’s work” might shed a tear or two for the small child clinging to her elderly Grandmother’s hand as she searches in Athens for an ATM that will give her $66 from her bank account – the maximum allowed per day under the newly imposed capital controls. According to investigative reports that appeared in Der Spiegel, the New York Times, BBC, and Bloomberg News from 2010 through 2012, Blankfein, now Goldman Sachs CEO, Cohn, now President and COO, and Loudiadis, a Managing Director, all played a role in structuring complex derivative deals with Greece which accomplished two things: they allowed Greece to hide the true extent of its debt and they ended up almost doubling the amount of debt Greece owed under the dubious derivative deals. For the unschooled to the ways of Wall Street, one might jump to the conclusion that Greece and its finance officials were knowing participants in the deal. That would be a reasonable assumption were it not for counties and cities and school districts across America that were similarly fleeced and hoodwinked by investment banks on Wall Street. In March 2010, the Service Employees International Union (SEIU) released a study showing that from 2006 through early 2008, Wall Street banks are estimated to have collected as much as $28 billion in termination fees from state and local governments who were desperate to exit abusive derivative deals. That amount does not include the ongoing outsized interest payments that were, and still are being paid in some cases. Experts believe that billions of these abusive derivative deals may still remain unacknowledged by embarrassed municipalities.